I had a completely different plan for cooking today, but you know what? In the end I decided I just wanted some comfort food. 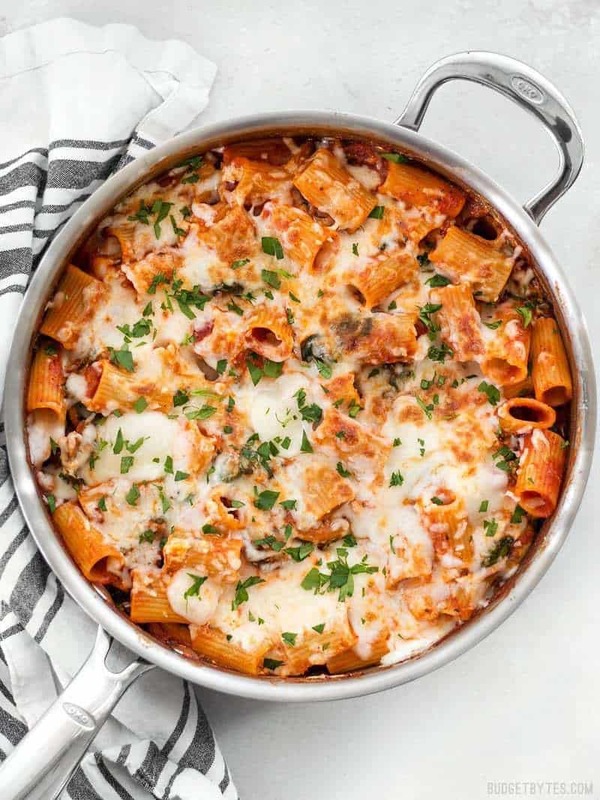 This Cheesy Rigatoni Skillet is just another version of my favorite easy comfort food—pasta, sauce, cheese, and whatever vegetables I can work into the mix. I’ve made several similar recipes in the past, but I figured why not document another one. Today’s was an east, skillet lasagna inspired variation with spinach and mushrooms. 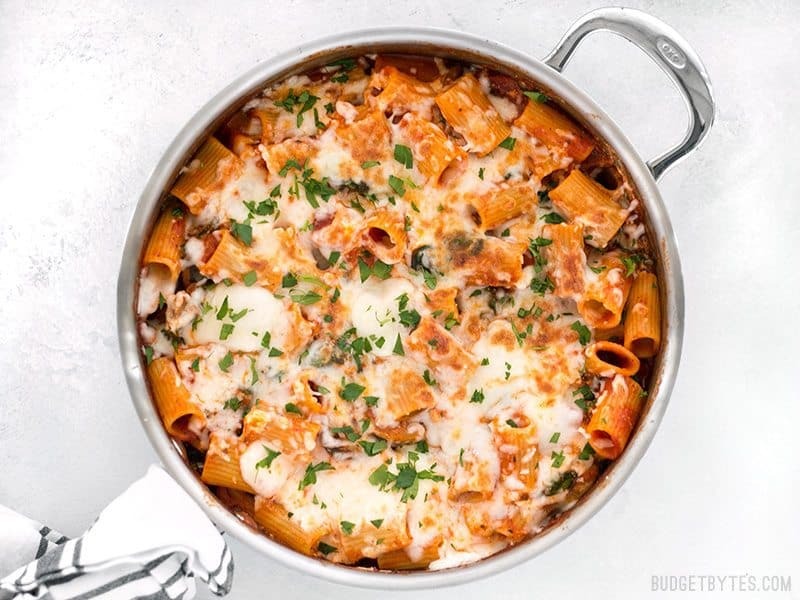 This Cheesy Rigatoni Skillet is a fast comfort meal for when you need dinner on the table fast! Like a fee-form lasagna packed with mushrooms and spinach. 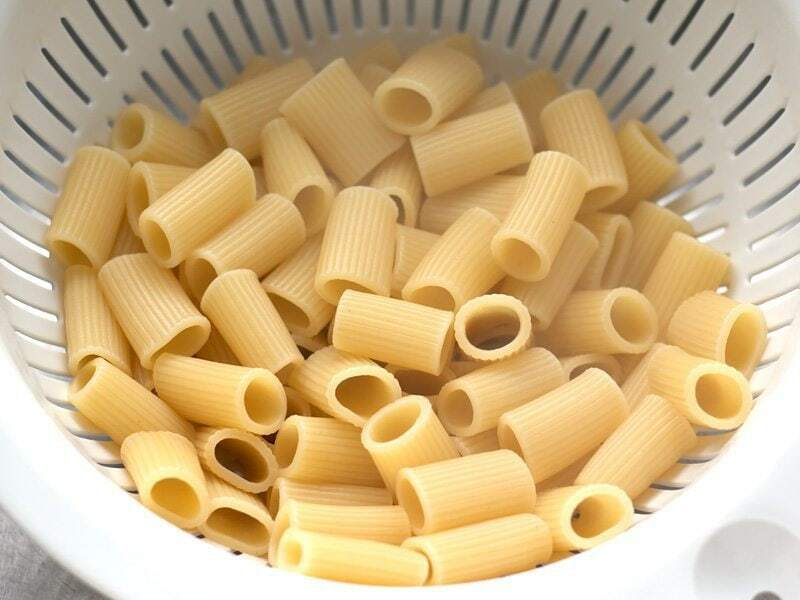 Bring a large pot of water to a boil for the rigatoni. Once boiling, add the pasta, and continue to boil until tender. Drain in a colander and set aside until needed. After starting the pasta water, begin the sauce. Add the olive oil and minced garlic to a large skillet and sauté for about one minute over medium heat, or just until the garlic becomes fragrant. 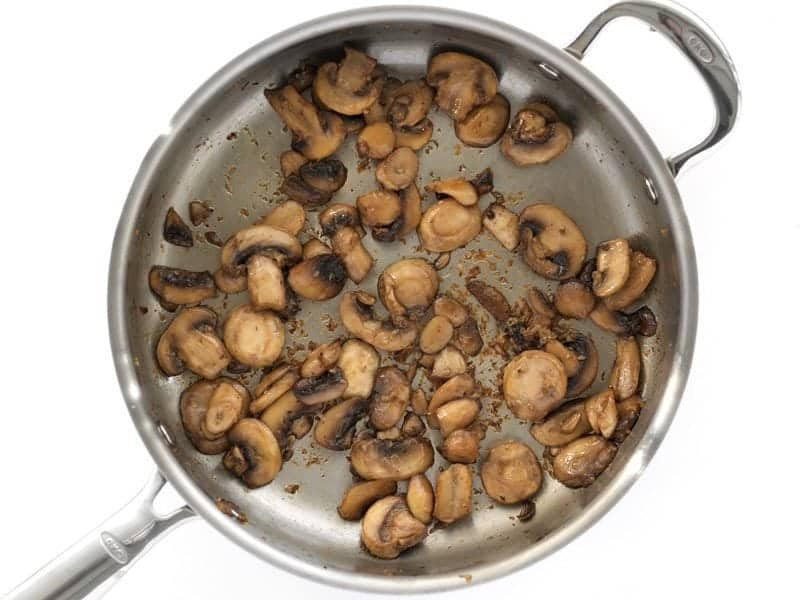 Add the sliced mushrooms, a pinch of salt and pepper, and continue to sauté until the mushrooms have released all their moisture and begin to brown on the edges (about 5-7 minutes). Add the sauce to the skillet. Stir the sauce as it heats, dissolving any browned bits off the bottom of the skillet. 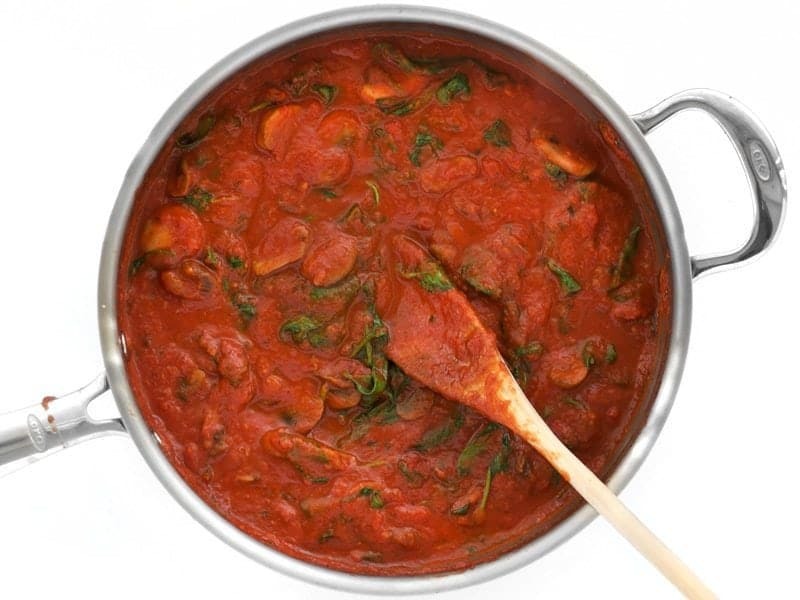 Once the sauce is heated through, add the spinach, and continue to stir and cook until the spinach has wilted (about 5 minutes more). 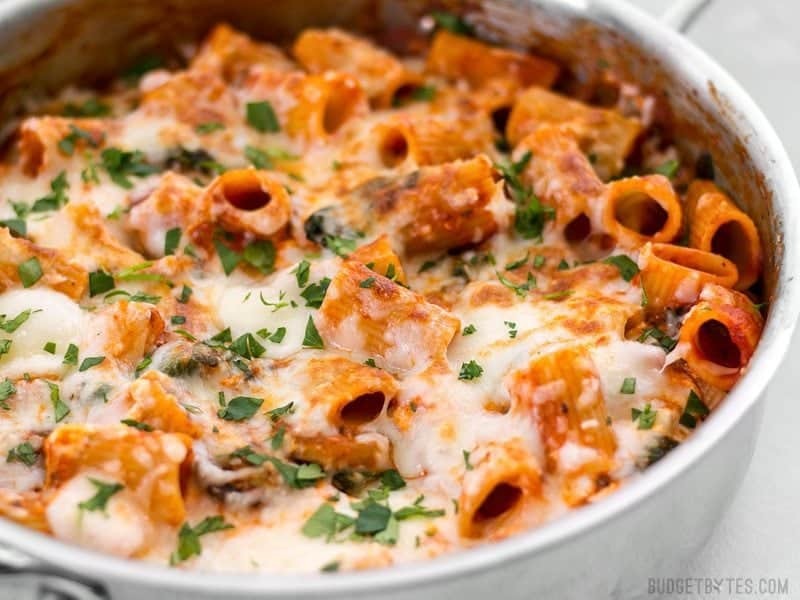 Once the rigatoni has been cooked and drained, stir it into the skillet with the sauce and vegetables and allow everything to heat through. 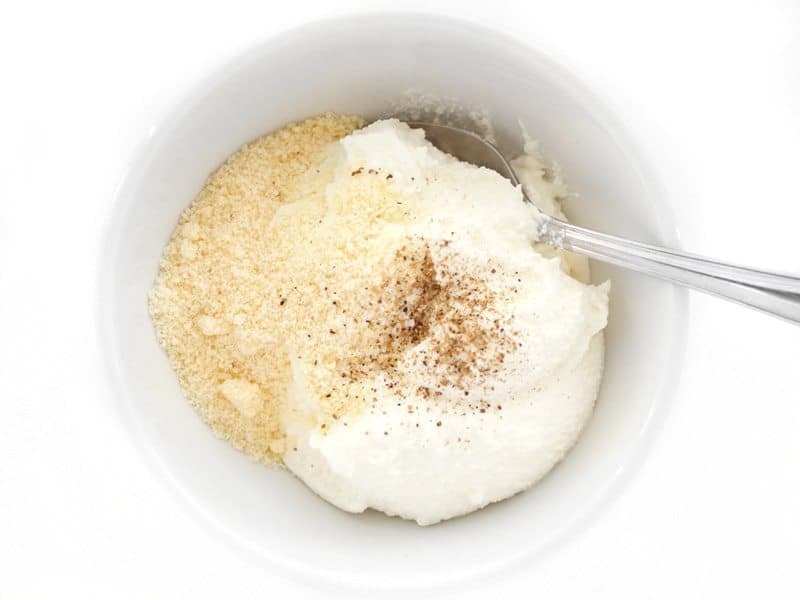 In a small bowl, stir together the ricotta, Parmesan, and a pinch of salt and pepper. Add the ricotta mixture to the skillet, in dollops over the surface. 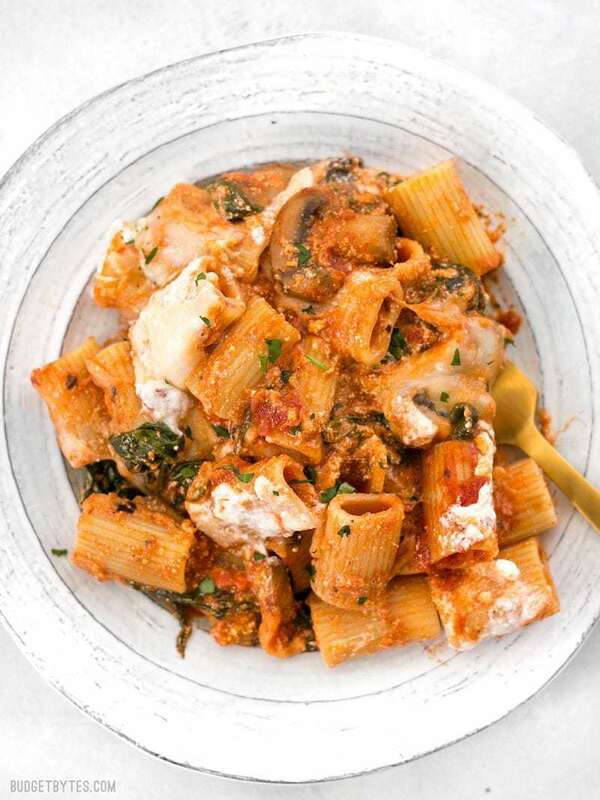 Gently fold the ricotta into the pasta, leaving it only about half mixed, so there are still pockets of ricotta within the sauce and pasta. Sprinkle the shredded mozzarella over the pasta, place a lid on the skillet, and let it heat over medium-low until the cheese is melted. If you want the cheese to brown a bit, place it under your oven's broiler (without a lid) and watch closely until it develops a few browned spots. Serve hot. 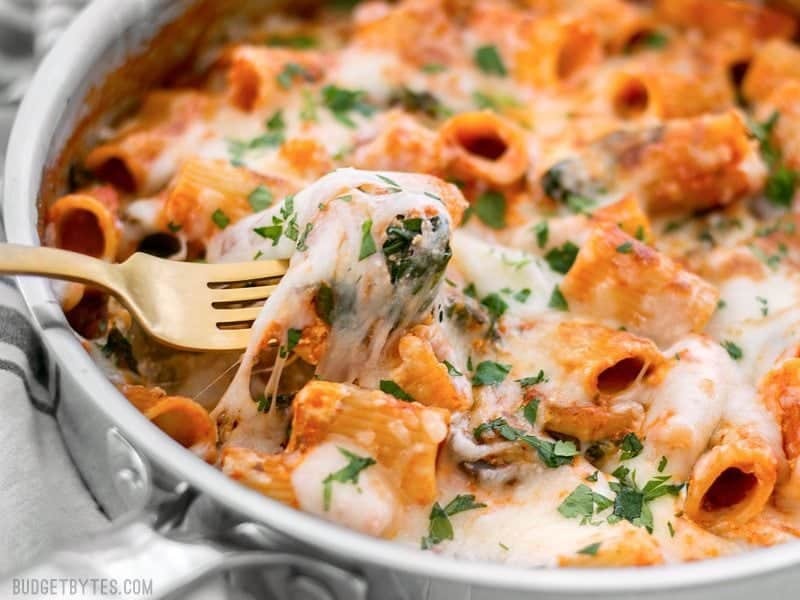 Really, is there anything better than cheesy pasta?? Then add 24oz. of your favorite sauce. 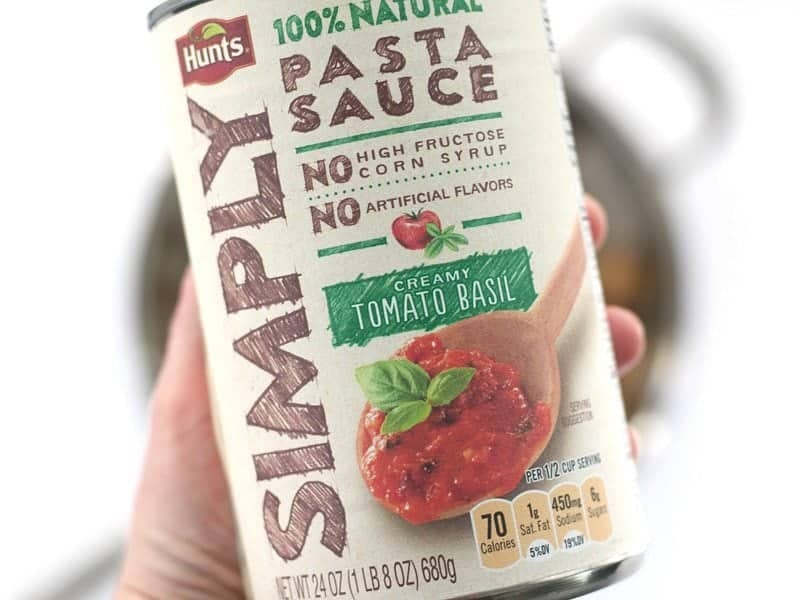 I bought this sauce on a whim because there was a sign that said it was 40% off (it did NOT ring up 40% off and I didn’t notice ’till I was home, boooo.) and it happens to be REALLY good. So good that I want to go back to the store and buy six more. And no, this is not sponsored in any way, I just wanted to share that it was surprisingly good. It has just a touch of cream and chablis, which gives it a really subtle amazing flavor. I want to eat it as a soup. Ha! After adding the sauce, stir it as it heats and make sure all the brown bits are dissolved off the bottom of the skillet. Once the sauce is hot, add 1/4 lb. fresh spinach. 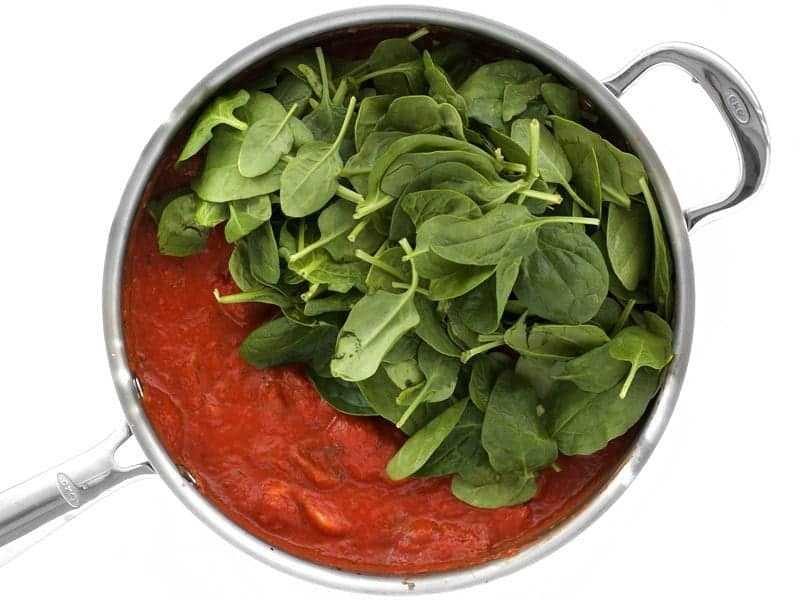 Stir and cook the spinach in the sauce until the spinach has fully wilted (about 5 minutes). By this time your rigatoni should be finished cooking and drained. Add the rigatoni to the sauce and stir to combine. In a small bowl, stir together 8oz. whole milk ricotta, 2 Tbsp grated Parmesan, and a pinch of salt and pepper. I will say that ricotta varies quite a bit from brand to brand and I’ve had some that are really not very good. I would stay clear of fat-free ricotta, for sure. I used Breakstone’s today and it was great (again, not sponsored). Add the ricotta mixture in dollops on top of the pasta. Gently fold the ricotta into the pasta, leaving it only about half mixed, so you still have some nice big caches of cheese throughout. Finally, sprinkle 1 cup shredded mozzarella over top and either place a lid on the skillet and let it heat over medium-low until the cheese melts, or place it under your oven’s broiler (no lid) until the cheese is melted and slightly browned. Serve hot. Total comfort in a skillet right there. 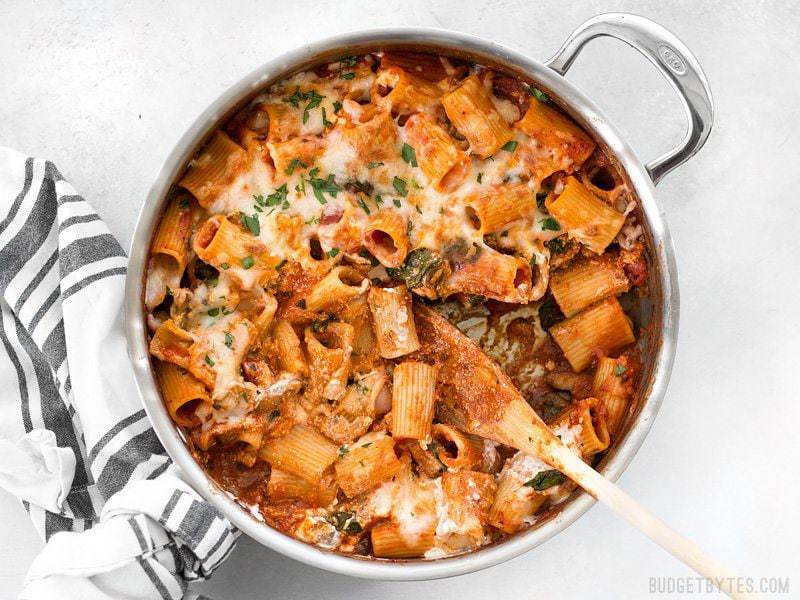 I’ll take a big ol’ plate of that Cheesy Rigatoni Skillet, please and thank you! Wow, I made this tonight and it was delish! I like the mushroom and spinach combination and you don’t even need the meat. Thanks for the great recipes in this website! I made this quickly this evening for some last minute dinner guests in under 30 minutes. It was SO good, there were no leftovers left! I made this in my Le Cruset dutch oven and it came out great. I will absolutely make this again. Yum!!! I can’t wait to try this!!!! Quick and easy recipe! And yummy too. I ended up adding spicy Italian sausage. Recommend this recipe if your looking for a solid and easy to make meal. I just made it in between studying. This. looks. amazing. Amazing food, better than a restaurant…all for $2 a serving and quicker than takeout. I don’t understand my colleagues who fork over $10 for lunches, I really don’t. Question – what kind of saute pan are you using? Is it a 3.5 or 5.5 qt? Just made this for dinner. So good! I’m kind of learning to cook right now and your website is my favorite for recipes. Tried this tonight- it was fantastic! Wish I would have broiled it, but it turned out fine anyway! Next time I may add some protein to bulk it up a little for leftovers. Made this tonight and is super delicious! Almost like lasagna in a skillet. this looks amazing -can’t wait to try it! Wonderful Directions and photos. This is something that a person with little kitchen knowledge can prepare and look like a gourmet chef. Thank you! I LOVE the “goes great with” feature you added!! I cook almost exclusively from your Blog and am always trying to make a full meal! Thank you! I’m trying to go back through and add those to older posts as well. I just pinned this because it looks soooo good. 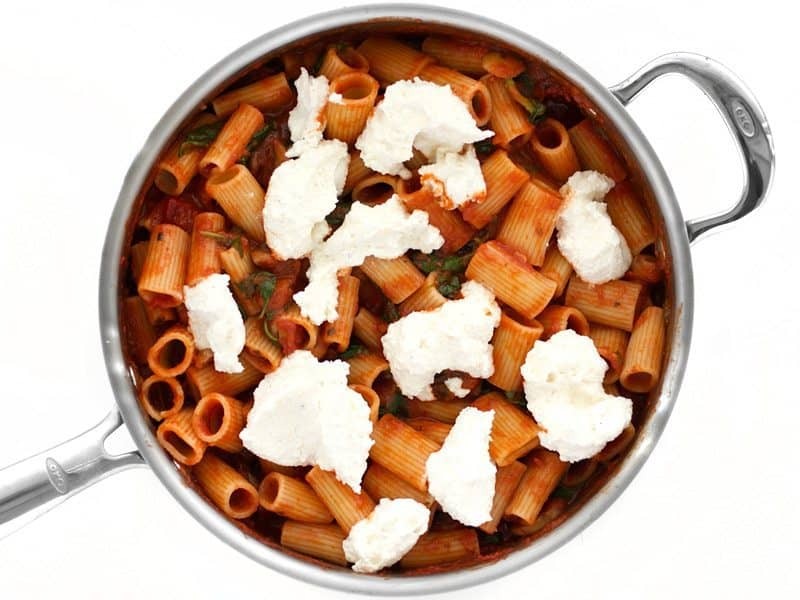 Rigatoni is in my top 2 favorite pasta shapes (tied with bucatini). This looks delicious!